How can I control the access rights of users on the account? In order to change a users access, you must first be an account administrator. If you are not, please contact your account administrator to make the change. Please navigate to the project you wish to change the user's access for. From there, click on the drop-down menu next to the user's name and select the new access level you wish to switch them to. When you are done, scroll to the very bottom and click on the blue "Save" button. What Do the Different Access Levels Mean? 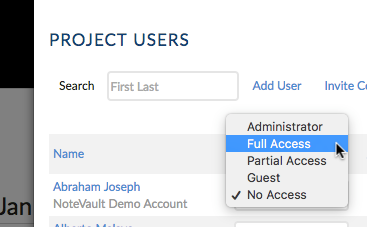 Guest Access - Project is visible under active projects list. User has read-only rights. User can see all notes contained within project but cannot edit any notes or add any notes. Partial Access - Project is visible under active projects list. User can only see his/her notes within project. They cannot view other notes contributed by other users on project. Full Access - Project is visible under active projects list. User can see and edit all notes contributed to project. Including those of other users on project. Administrator - Project is visible under active projects list. User can see and edit all notes contributed to project. Including those of other users on project. User can also adjust other users access levels and features within project.